Athens, Greece (CNN) -- Greece has accepted an international aid package worth 110 billion euros (US $146 billion) over three years, according to eurozone finance ministers. The bailout deal includes a promise by Greece to cut its budget deficit to 3 percent of gross domestic product by 2014, that country's Finance Minister George Papaconstantinou said. The package was negotiated by the European Central Bank, European Commission and International Monetary Fund. Of the overall amount, 80 billion euros will be made available through euro-area members, with up to 30 billion available in the first year, Juncker said. The first disbursement of bailout money will be made before May 19, Juncker said. The program will "help restore confidence and safeguard financial stability in the Euro area," Eurogroup President Jean-Claude Juncker said Sunday. President Barack Obama spoke by phone with Greek Prime Minister George Papandreou about the agreement Sunday, according to the White House. "(Obama) welcomed the ambitious reform program announced by the Greek authorities, as well as the significant support that was agreed to by the IMF and Eurozone members," the White House said in a statement. "The two leaders discussed the importance of implementation going forward." Olli Rehn, the commissioner of Eurogroup, said "the steps being taken, while difficult, are necessary to restore confidence in the Greek economy and to secure a better future for the Greek people." The head of the European Commission on Sunday praised the Greek government for committing to "a difficult but necessary reform process." The program "constitutes a solid and credible package," Commission President Jose Manuel Barroso said in a statement. The planned austerity measures are unpopular among Greeks. Protesters clashed with police Saturday during May Day demonstrations, and strikes have been announced for later this week. Papaconstantinou confirmed Sunday that the government would tighten its belt significantly, despite the protests. "The expenses of the public sector will go down very considerably," he said. The program includes cuts in the salaries of public-sector workers, including lawmakers, higher taxes on cigarettes, fuel, gambling and luxuries, an increase in the value-added tax consumers pay on purchases, and an increase in the retirement age for women in the public sector, Papaconstantinou said. Prime Minister George Papandreou earlier Sunday tried to rally the country behind the government. "I know that our compatriots are being asked to make big sacrifices, but the alternative way would be disastrous and painful for us," he said in a televised Cabinet meeting. "It's not a pleasant decision for me, for any of us, but we are here to make the right decisions for our country," he insisted. 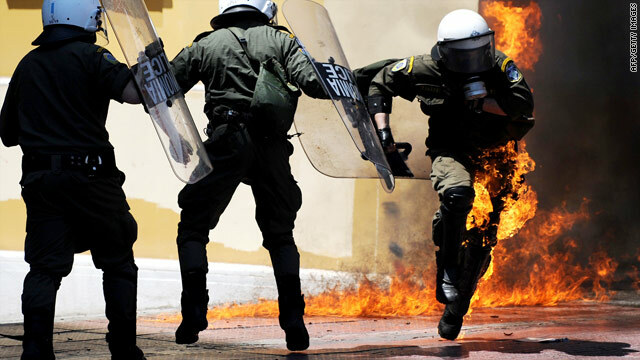 He spoke a day after Greek protesters clashed with police who fired tear gas during the annual May Day rally in Athens. Waving red flags, the crowd at times surged toward the line of police, who wore helmets and carried riot shields. The police pushed them back each time. Protesters threw objects toward police, and scattered fires were burning on the streets. Seven police officers were injured, police said. Nine people were arrested -- three for attacks on police and six for theft from stores. Twenty-seven people were questioned in connection with violence. A van belonging to state broadcaster ERT was set on fire. About 12,000 people were protesting in Athens, and rallies were also taking place in the northern city of Thessaloniki, a police spokesman said. Protesters there smashed two ATMs, the glass frontage of a bank, and a car, but no one was arrested or being questioned, the spokesman said. The Greek government is facing a large deficit and massive debt, ultimately threatening the stability of the euro. The currency is used by 16 countries across Europe, including Greece. Greece's national debt of 300 billion euros ($394 billion) is bigger than the country's economy, and some estimates predict it will reach 120 percent of gross domestic product in 2010. CNN's Diana Magnay, Erin McLaughlin and Bharati Naik, and journalist Mary Retiniotis contributed to this report.